Right now all the Dogwood trees in your neighborhood are loaded with bright red seed pods. 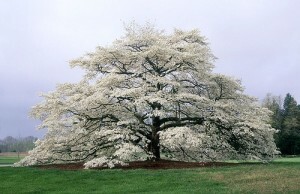 Here is the step by step formula for growing Dogwood trees from seed. 1. Collect the seed pods from the tree, or even from around the tree on the ground. 2. Soak the seed pods in a pail of water for several days to soften the outer coating so you can easily squeeze the seeds from the pods. to the pail so it slowly overflows. Tip the pail slightly and allow the pods to wash out of the pail until all of the pulp is out of the pail. 4. Using a strainer or a window screen pour out the water and seeds, catching the seeds in the strainer or screen. Allow the seeds to dry in the sun for a day or two. Be careful where you put them to dry because chipmunks and other critters love them and will eat them all when you aren’t looking! 5. Once dry collect the seeds and place them in a paper bag to store in a cool dry place until February 1st. On February 1st put mix them up with some sand, and or peat moss and place in a plastic bag. Place the bag with the seed mixture in the refrigerator and leave it there for 90 to 100 days. Don’t let it freeze. Freezing won’t hurt the seeds but it will stall the stratification process. 6. After 90 to 100 days fill a plastic flat with a good seed starting potting mix. Use a mix that drains well. Pour out the seeds and peat/sand mix on top of the flat, the cover the seeds with about 1/4″ of soil. 7. Place the flat in a partially sunny, partially shady location. Keep the flat watered, but allow the soil to dry between waterings so the soil has a chance to warm up and initiate germination. Within a few weeks to several weeks you’ll start to see your tiny little dogwood trees emerge. 8. You can leave them in the flat until fall, or you can transplant them to small pots or cell packs before they are rooted in. That’s it. You can use this same process for Chinese dogwood as well. Mike McGroarty is a Garden & Greenhouse contributing editor, the owner of McGroarty Enterprises and the author of several books. You can visit his website at Freeplants.com and read his blog at Mikesbackyardnursery.com.